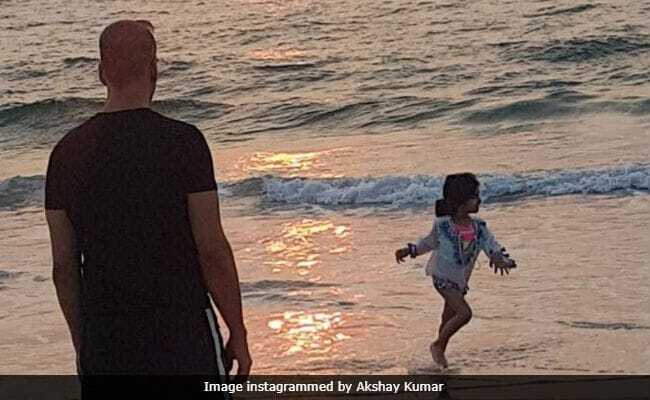 Seen This Pic Of Akshay Kumar And Daughter Nitara On The Beach Yet? Akshay postponed the release of PadMan by two weeks for "Padmaavat"
Akshay and Twinkle's PadMan was earlier slated for January 25 release. However, the makers decided to postpone the release by two weeks for director Sanjay Leela Bhansali's much-delayed "Padmaavat." Akshay and PadMan director R Balki met Mr Bhansali and jointly decided to let "Padmaavat," starring Deepika Padukone, Ranveer Singh and Shahid Kapoor, release first. "It is essential for them to release the film at this time, their stakes are higher than mine," Akshay told reporters at a press conference. PadMan is based on the story of Chennai's entrepreneur Arunachalam Muruganantham, who invented a low-cost sanitary napkin making machine. The story of his life was adapted by Twinkle Khanna in shirt story, titled A Sanitary Man From A Sacred Land in her second book - The Legend Of Lakshmi Prasad. PadMan recently became the first Indian film to be screened at Oxford. PadMan also stars Sonam Kapoor and Radhika Apte. The film will now release on February 9 when it will clash with Neeraj Pandey's Aiyaary, starring Manoj Bajpayee and Sidharth Malhotra.